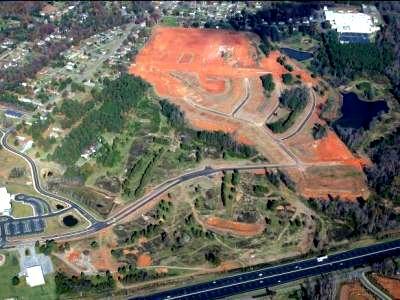 Designed 2006-2007 in the City of Mebane, just north of I-85/40 off of Mebane Oaks Road for Stokes Land Group. Construction started in 2007 and continuing. 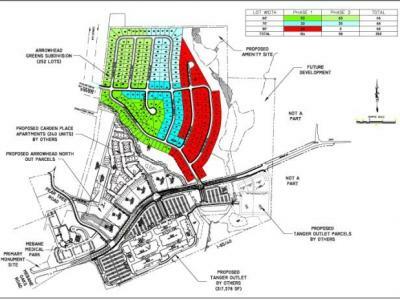 Multi-phase site with 212 Acres of Mixed Use (Residential-Arrowhead Greens Subdivision, Multi Family- Carden Apartments (by others), Commercial/Retail- Tanger Outlets (by Others), Medical- Alamance Regional Medical Park (by Others)). Streams, wetlands, and water quality issues were a tremendous first obstacle with the development. There were three ponds and three streams wandering thought the site. There are 3 stream crossings and a 110 Foot long Conspan bridge was installed to avoid exceeding the 150 Linear Foot limit on the removal of perennial streams. Also, all three ponds were submitted for hazard classification with one pond being permitted for breaching because of it's high hazard classification. The Erosion Control plan consisted of 10 phases because of the complexity engendered by the three streams. Four wet detention basins were constructed to treat storm water runoff from the site.